Crolla says messages of support have "meant the absolute world to me and my family"
Anthony Crolla has vowed to come back "stronger than ever" after suffering a fractured skull and a broken ankle in a confrontation with burglars. The 28-year-old was forced to pull out of January's WBA world lightweight title bout with Cuba's Richar Abril. He needed a plate and pin in his ankle and 12 stitches in a head wound. Crolla tweeted: "It'll be a tough road back but I promise that I will be back stronger than ever in 2015. Thanks so much again." 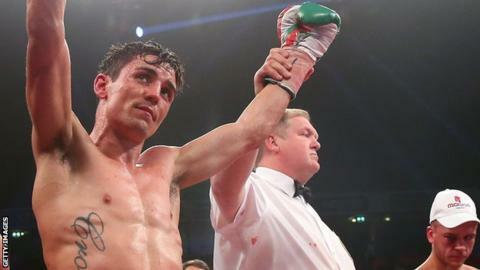 Crolla saw two alleged burglars fleeing a neighbour's back garden in Chadderton, Greater Manchester, and was hit with a concrete slab in the incident. A 17-year-old boy was arrested on suspicion of assault, burglary and possession with intent to supply drugs. "I can't thank everyone on here enough for all the messages of support," Crolla added. "Honestly taken aback by them all, they've meant the absolute world to me and my family. "I'm devastated over what happened and having to pull out of my fight but I've got a lot to be thankful for as I'm a very lucky man." Crolla, who has won 29 of 35 professional fights, was set for the biggest bout of his eight-year professional career in Manchester on 23 January.